For many home hydroponics is usually partaken indoors, in a closed garden space perhaps in a spare room, garage or backyard patio. And when people think indoors, many think small. This is probably true for the 75% of recreational home hydroponics growers. Few may be lucky enough to have a large garden without having a high-scale professional greenhouse set-up. I will rate my top 5 specifically indoor hydroponic systems and I will try to include something for everyone. Before reading my top rated hydroponic kits (and probably heading straight to number 1) you need to work out which hydroponic kit is best for you. And yes I will help you. Read and answer the criteria listed below. ​What do you want to grow? What space do you have available for your hydroponic setup? Keep those answers in mind, read through my product descriptions and at the bottom I will bring everything together. Not the prettiest of hydroponic kits, but this product definitely makes up for it in practicality and quality. This product is neat and small, perfect for growing leafy greens or flowers for those who have limited garden space. It’s inexpensive, perfect for a beginner who wants to start small and is possibly building their very first hydroponic garden. Everything fits into a 5 Gallon bucket, which requires little maintenance and ensures your garden space (however small) remains tidy. This kit does have a downside, for those whose garden space does not have access to natural light; this kit does not include a grow light. Don’t let that discourage you, as hydroponic grow lights are relatively cheap, especially for the size required for this small-scale hydroponic setup. PowerGrow has dominated the hydroponic kit market; as you can see, they have two products within my top 3. They do offer products beyond the DWC method but are more renown for this hydroponic system, receiving rave reviews and many happy customers. nutrient solution (to keep your plants happy and healthy). This system is best for growing lettuce and annual vegetables. One of the more high-tech products and by no means just a pretty face. This would have to be the most simplistic, low-maintenance hydroponic kit on the market, period. It does not come cheap, but its high-tech features do not fail to impress. This kit is the most popular out of indoor grow kits of any size, and for good reasons;, this hydroponic kit is small enough to fit in any garden space and includes absolutely everything you will need and a few extras. There are a range of Miracle-Gro AeroGarden models, differing in size and price. This product, though not the cheapest of the range, is easily the most popular. This kit pretty much does everything for you; it has an automated timer, which allows it to adjust light for the particular growth stage. It also has an alarm to remind you when it’s time to feed your plant. This product is modern, with LCD controls and needs practically no construction. This product comes with a highly efficient and, may I say, high intensity LED grow light that can be adjusted in height as your plant grows. This product is popular for growing herbs or vegetables and comes with the option of 7 different herb seeds and 7 kinds of vegetable seeds. 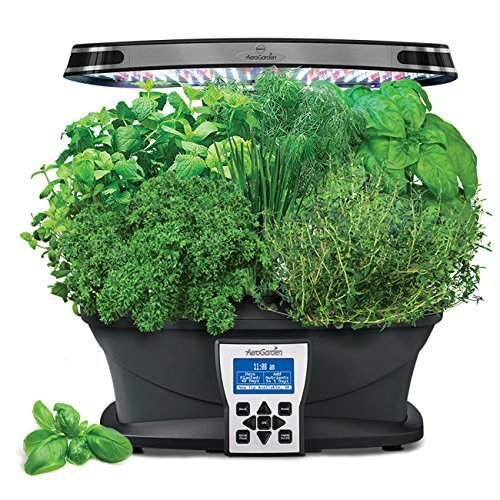 This product resembles a more back to basics although within the AeroGarden range. You could call this product the little sister of the AeroGarden Ultra LED; this product is not only cheaper but perhaps less flashy and more practical than it’s older sibling. This AeroGarden model is a little smaller in height and width and instead of a high definition LCD touchscreen it has a practical button control panel. This product is aimed at the entry-level hydroponic grower who wants to start off small with an herb garden. It is a relatively smaller hydroponic system than my number one but it still has the ability to grow small vegetables. This small hydroponic setup is perfect for a small garden and comes with the standard features available in the hydroponic range such as automated light timer,and alarm for feeding reminders. 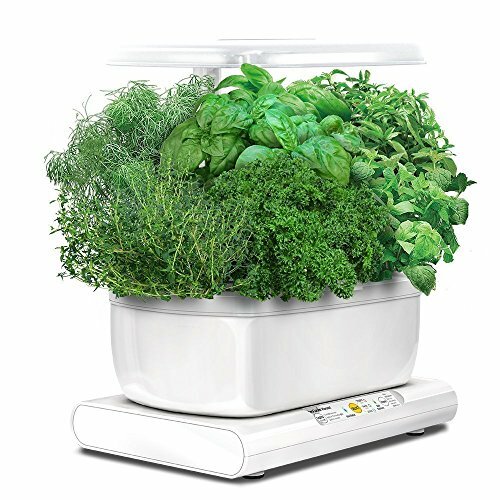 This product, like any in the AeroGarden range, requires little maintenance and thanks towith its automated system, it is easy to use. If you're not only looking for an extravagant indoor centerpiece but also a highly self-sufficient ecosystem, stop right here. This product is very very popular and well reviewed; popular with the environmentally conscious grower and for educational use in classrooms. This products uses the DWC method and is self-sufficient, naturally cycling of water and nutrients through the symbiotic relationship between the fish and plants. The fish provide nutrients for the plants and in return the plants provide clean water and oxygen for the fish. 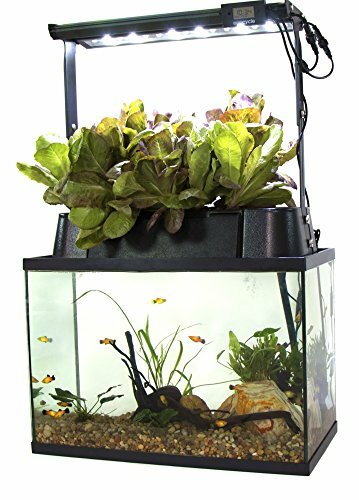 This product does not come cheap, but it allows you to grow leafy greens and herbs whilst enjoying the satisfaction of having fish. This kit has absolutely everything you need for a indoor hydroponic system and a fish tank. This product is more for the transitioning home hydroponics garden from beginner to intermediate. Hydrofarm is a renowned brand within the hydroponic market and some traditional hydroponic gardeners would expect this well-known brand to feature higher. This product is the most basic indoor hydroponic system manufactured by Hydrofarm. 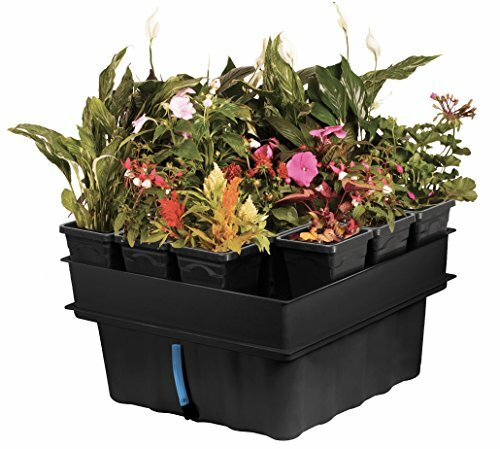 This product is designed for a home hydroponics grower with a medium-large garden space, boasting a 15 pot, 4-foot square set-up, best for growing small to large vegetables and flowers. The functioning heart of this product features a highly efficient flood-drain pump irrigation system ensuring your plants receive just the right amount of the nutrient solution, which will guarantee that they thrive. This product sits within the middle budget range but it is worth your pretty penny as it's jam-packed with the elements listen below, all except a grow light. Don’t let that deter you. If you still don’t have answers to the questions that I mentioned in the beginning don’t fret, I will make sure you do after the following short paragraphs. There is a limit to what you can grow out of a small hydroponic setup; many of my rated kits are perfect for beginners or kids wanting to start basic with herbs or lettuce. I have included some options for those who would like to move on from herbs to vegetables and larger plants. What Space Do You Have That’s Available For Your Hydroponic Garden? This will be a major factor for some, most of the below kits have built in grow lights; however, for the DWC bucket kit, unless you have access to sunlight, you will need to purchase a grow light. Keep in mind that for this particular product you will need floor space for the bucket and for whichever grow light you will choose. A cheap and easy option is an LED bulb, which you can get starting at around $10, which will produce plenty of the light required by this small hydroponic system. This, of course, is quite important; all of the below kits are a similarly good quality despite the range in price. 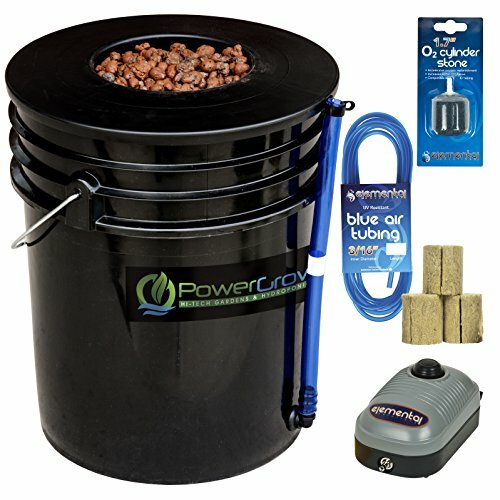 You pay more for the technology that is included, like an LCD touch screen (~$300.00) compared to a fairly manual DWC bucket kit, which is available for ~$30. Hopefully I have helped you in some way, whether it be finding a hydroponic kit from my list or arming you with the right knowledge for you to find another product that is best for you. With the right hydroponic kit, hydroponic gardening will not only be made easier and more simplistic but more enjoyable for the first-time gardener, the recreational gardener and even the kids.